Garlic is a member of the Lily family, a cousin of our favorite onions and leeks, extremely flavorful and healthy. Garlic consists of a so- called bulb, which is composed of separate cloves. As onions, individual cloves are wrapped in a skin similar to a shell, which can be white or pink. The cloves themselves are off-white in color and still have a hard texture can be easily cut or crushed. Originating from Central Asia, garlic is one of the oldest cultivated plants in the world, produced for over 5000 years. 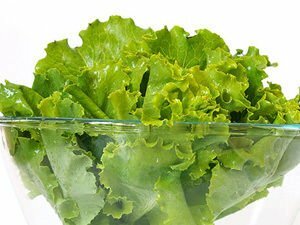 Ancient Egyptians were among the first to cultivate it, and it plays an important role in their culture. Garlic was not only considered to have sacred qualities and placed in the tomb of the pharaoh, but was given for consumption to people who built the pyramids, in order to improve their stamina and health. Garlic was also revered by the ancient Greeks and Romans, whose athletes ate garlic before sporting events, and soldiers - before going to war. By the 6th century BC, garlic had become famous in China and India. 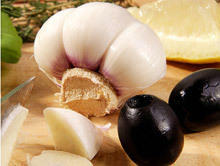 Through the millennia, garlic is a favorite plant of many cultures due to its culinary and medicinal properties. Today, China, South Korea, India, Spain and the U.S. are among the leading manufacturers of commercial garlic. 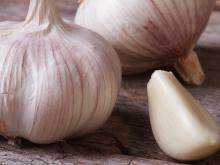 Many have long discovered the antimicrobial properties of garlic. Already in 1858, Louis Pasteur confirmed them, and in the 20th century, Albert Schweitzer successfully applied it for the treatment of dysentery in Africa. Garlic is an excellent source of manganese, vitamin B6 and vitamin C, protein and thiamin (vitamin B1), and the minerals phosphorus, selenium, calcium, potassium, iron and copper. Approximately 28 g garlic contains 42 calories and 1.8 grams of protein. Recently, the composition of garlic was discovered to have the chemical element germanium, which is known for its anticancer properties. Garlic contains over 200 bioactive compounds, the most important of which are alium and allicin. To preserve the flavor and nutrients contained in garlic, you need to buy it fresh. 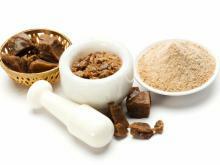 It is also available dried, powdered or in the form of paste. When buying garlic, it is important to ensure that it has a solid shell and is not soft, shriveled and have begun to sprout its leaves. Fresh garlic is stored in uncovered containers in a cool, dark place. In culinary applications, garlic is often used as a spice and as a product - both fresh and heat treated. 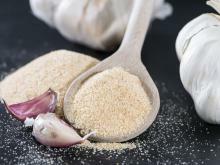 Crushed garlic paste with saltis used in tarator, tripe, trotters, fish sauces and in meat dishes and stews. Besides all that, garlic is one of the main ingredients of pickles. 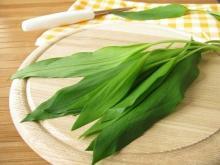 It is often combined with parsley, which is believed to neutralize the heavy odor temporarily. To be able to peel the cloves easier, place them on a cutting board and press them with the blunt side of the knife. Preferably, sauté garlic at a lowe temperature for a short time. 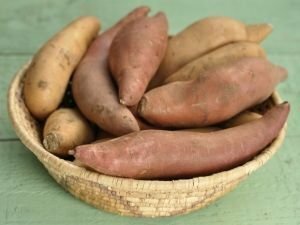 If cooked too long at high temperature, it darkens and becomes bitter. When chopping, grinding or crushing in a suitable press more of the essential oils of garlic are released and its taste is sharper than if sliced. 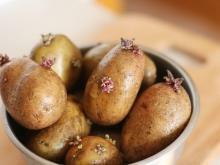 If you want to prepare garlic bread, rub toasted bread with garlic and sprinkle with olive oil. 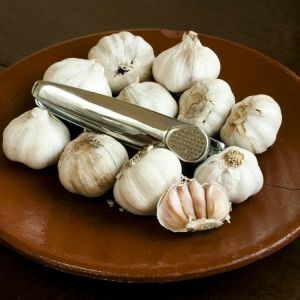 To remove the pungent smell of garlic from your hands, rub them first with salt or lemon juice, then wash off with soap. 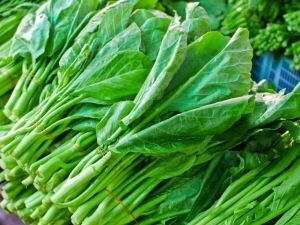 Chopping or crushing garlic cloves stimulates enzymatic process that converts plant matter chiefly in allicin, which is responsible for major health benefits that garlic has. In order to allow for maximum production of allicin, you have to wait a few minutes before eating or preparing already chopped or crushed garlic. 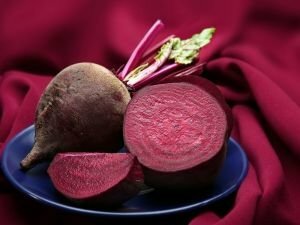 Numerous studies demonstrate the potential benefits of regular consumption of garlic for blood pressure, platelet aggregation, triglyceride serum and cholesterol levels. 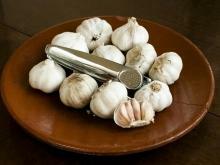 Regular consumption of garlic may also help stimulate the production of nitric oxide in the blood vessel walls. The compounds in garlic may also help prevent atherosclerosis and diabetes, as well as reduce the risk of heart attack or stroke. One reason garlic has many beneficial effects is its ability to reduce the amount of free radicals in the blood. 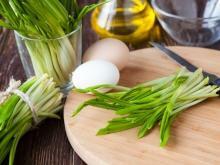 Garlic and onions contain compounds that inhibit lipoxygenase and cyclooxygenase - enzymes that produce inflammation. 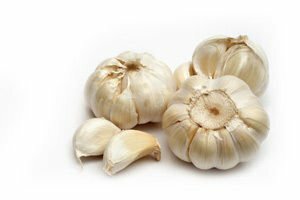 The anti-inflammatory effect compounds with vitamin C contained in garlic, especially fresh garlic, helping to protect you in some cases of asthma, and to reduce pain and inflammation in osteoarthritis and rheumatoid arthritis. 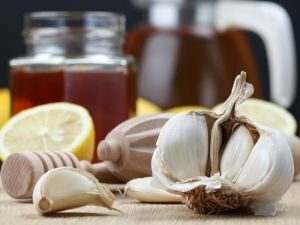 In addition, allicin, one of the sulfur compounds responsible for the characteristic smell of garlic, is a powerful antibacterial and antiviral agent. 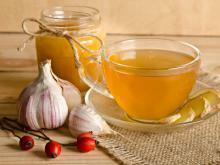 Thanks to it, garlic is a powerful antibiotic and even participates in many medicines. Eating garlic and onions reduces the risk of certain cancers, namely cancer of the oral cavity and pharynx, esophagus, colorectal, throat, breast, ovarian and prostate cancer and reduces the risk of renal cell carcinoma. Garlic protects from asbestos, which is also a carcinogen. 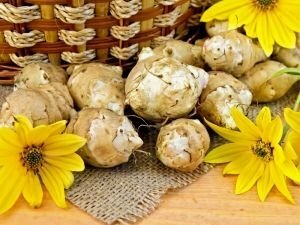 The most powerful active ingredient in garlic, allicin, prevents weight gain. 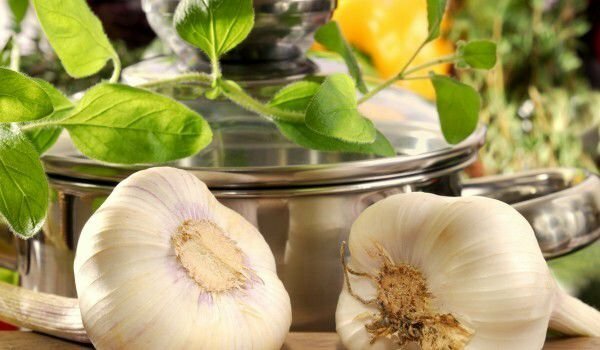 Garlic should not be consumed by people who have increased gastric secretion, diseases of the kidneys, gall bladder and liver. It is not recommended for lactation and pregnancy. People with a known allergy to any component of garlic should also refrain from consumption.